Taipei, Feb. 12 (CNA) Tainan City government called off rescue missions in the rubble of a collapsed apartment complex Saturday, from which 114 people were found dead, bringing the death toll to 116 in a magnitude 6.4 earthquake that hit southern Taiwan Feb. 6. 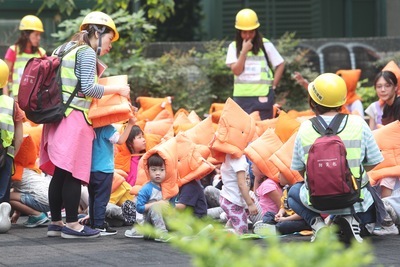 Of the 116 confirmed deaths, 32 bodies from the collapsed Weiguan Jinlong apartment complex in Tainan's Yongkang District, including those of two boys, were yet to be claimed, the city government said. Tainan Mayor Lai Ching-te (賴清德) called off the rescue missions after the last body -- that of Hsieh Chen-yu (謝鎮宇), head of the building's management committee -- was found at 3:57 p.m., 180 hours after the quake hit at 3:57 a.m. last Saturday. The other two victims were in the city's Guiren District who were hit by falling objects. Throughout Tainan City, 507 were hospitalized, 438 of whom have since been discharged from hospitals, according to the city's tallies. City officials said rescuers pulled 289 people from the collapsed 17-story Weiguan Jinlong apartment building, 175 of whom survived. Of those survivors, 96 were sent to hospitals for medical treatments. Lai said the city government has confirmed receipt of more than NT$80 million in donations for the victims, with over NT$800 million committed by mostly business owners yet to be received. He promised to use the donated funds to help victims and their families rebuild their life. "If only young children are left in a victim's family, they will be the government's responsibility," he said. Three persons, including the former chairman and two architects of the Weiguan company which built the apartment complex, were detained on charges of negligence of duty causing deaths after the local court approved a prosecution request for the detention. Jerry-building by the real estate development company is believed to be one of the causes of the collapse of the apartment complex. Tainan District Court has also granted a city government request on behalf of the victims for a provisional attachment of the three suspects' assets. The mayor said he will ask the court to hold more people accountable, including former major shareholders of the construction company and members of its board of directors and supervisors.